Shop personalized gifts in designs for every interest featuring Kyle's unique artwork. You know what you love - now you can share those passions with handcrafted gifts that are expressions of those strong interests. Love what you do? Share your passion for your life's work with creative professional themed gifts. 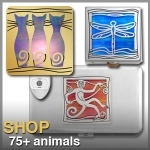 The wonderful world of animals is transformed into decorative gift items you can use every day - from decorative night lights that will keep you from tripping over the cat in the wee hours to precious pill boxes. Live for the phyical and mental challenges presented by competition? Then these sports gifts are great for starting up those all-important networking conversations with others who share your interests. Enjoy crafts, cooking, gardening and other pasttimes then these decorative gift items will put a smile on your face. Also find handcrafted products with fashionable designs such as clothing, crowns, and furniture. If you enjoy the great outdoors and it's bounty of foods and beverages, then these nature-inspired designs will restore your spirit. 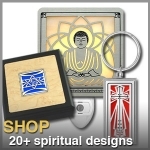 Those with a strong faith will appreciate a decorative gift items that express their deeply-held beliefs. Find symbolic gifts that have meaning. 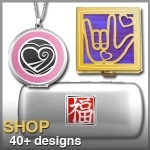 Select from popular signs, Asian characters, Zodiacs, anatomy, and more to customize a gift with a traditional symbol. A perennial classic, monogrammed gifts are always in good taste. 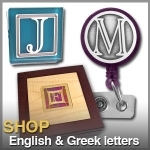 Chose any letter from the Greek or Roman alphabets. Have a significant birthday or anniversary coming up? Create a special keepsake to celebrate that special occasion. 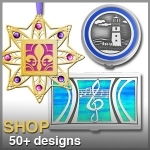 Shop Kyle's art, music and architecture gifts if you have a creative spirit or you love traveling. Have you ever thought, "this would be the perfect gift if only it were another color" or "I wish I there were more choices"? Well, now you can design your own look! 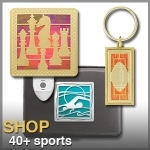 With just a few simple clicks, you can showcase your interests or express what you love with our unique personalized gifts that are custom crafted just for you from the highest quality materials. 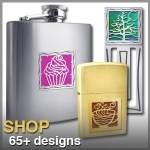 Choose from 100's of exclusive designs in silver or gold, vivid colors, & engraving. Through Kyle's innovative approach to designing, you can easily create the perfect gift for friends, family, or yourself and have it shipped to you within 1 - 2 business days.